Home / Articles / Cinco De Mayo Fundraising— ¡Olé! 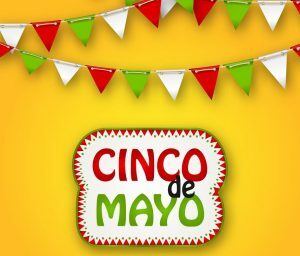 Cinco De Mayo Fundraising— ¡Olé! Cinco de Mayo is an important Mexican holiday. It's celebrated every year on the fifth of May to commemorate the 1862 Battle of Puebla, which was won by Mexican peasants over French soldiers. Today, Cinco de Mayo is a date of great importance for the Mexican and Chicano communities as it celebrates the day that 2,000 poorly trained Mexican peasants fiercely fought and won against a regiment of 6,000 French soldiers under the command of Napoleon III. Overall, the Cinco de Mayo victory is a special symbol for all Mexican people. It marks a day of freedom and liberty, as well as honoring those who fought and won against greater odds. Cinco de Mayo is celebrated by native Mexican people all over the world. Celebrations in Mexico typically include elaborate reenactments of the Battle of Puebla in a day-long dramatization that includes acting and speeches. In North America, Cinco de Mayo is a great fundraising opportunity as well. Many celebrate with huge fairs that include Mexican singing, dancing, feasting, costumes, sports activities, fireworks, and entertainment such as mariachi bands and traditional Mexican dancers. Entertain your friends with a Mexican feast. The menu should include popular specialties such as tacos and burritos, and perhaps even some freshly grilled fajitas. Also, make sure to have all the traditional fixings on hand, including salsa (mild, medium, and hot to suit all palates), guacamole, sour cream, shredded cheese, hot peppers, and don't forget the hot sauce! Remember that Mexican cuisine has much more variety than the commercial products you've tried at your local Mexican fast food joint, so take your menu south of the border with some authentic fare. Research Mexican cooking online, and make it a true Mexican fiesta to remember. Food can be sold per item, per plate, or you can charge your guests a flat entrance fee for all they can eat. Consider partnering with a local restaurant for your Mexican Fiesta. You help bring in the customers and they supply the venue. Coordinate a menu and event ticket price. It just may be a win win for you both. Details on Restaurant Fundraisers. Colorful flowers made of tissue paper are part of the fiesta decor in most traditional Mexican celebrations. Make some extra money by setting up a flower-making table. Charge flower makers a flat fee for tissue and supplies, and let them make colorful tissue necklaces, head circlets, and decorations to take home to loved ones. Part of the allure of a Cinco de Mayo celebration is the yummy – and spicy – food! Offer a tasting tent filled with a selection of hot sauces and dips with nacho chips and corn tortillas. A walk through the tent can cost $5 each. If your community is largely Mexican, chances are there are Mariachi musicians in the crowd. Ask some volunteers to play for the evening, and put out a guitar case or jar to take donations during your event. If you can't find any live musicians, CDs or downloaded music can be just as festive. The Mexican piñata is a symbol rich with Mexican history. These beautiful party staples are made from a variety of materials including clay pots, tissue paper, ribbons, tissue paper, and paper-mache. In Mexico, piñatas were originally filled with sweets and treasures. Offer the kids an area where they can make their own piñata to take home for a small fee. To make your wheat paste – mix together one part white flour with two parts water in a large plastic container, adjusting amounts to get the right paste-like consistency, and mix well until the lumps in the flour are gone. Fold a newspaper in half and tear it into strips. Make enough strips to cover the surface of your balloon twice. Blow up a large balloon. Place the tied end into the opening of a large drinking glass to hold it up-right while adding paper-maché strips. Dip each strip into the paste and then squeeze off the excess with your fingers. Add enough layers of paper-maché strips so the color of the balloon is not visible through the newspaper. Tie string to the top of the balloon and hang until completely dry. After the balloon is dried, you can use paint, colored markers, or more colored tissue to adorn your piñata.